Plants 10-80(-200) cm; nodal spines 0. 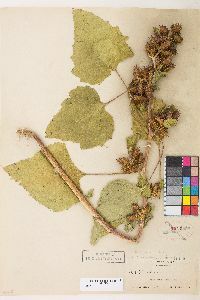 Leaves: petioles 20-100(-140+) mm; blades suborbiculate to ± pentagonal or deltate, 4-12(-18+) × 3-10(-18+) cm, sometimes palmately 3-5-lobed, abaxial faces green, hirtellous. Burs 10-30+ mm. 2n = 36. Flowering Jul-Oct. Damp or seasonally wet, often alkaline, soils, waste places, margins of agriculture; 10-2000 m; Alta., B.C., Man., N.B., N.S., Ont., P.E.I., Que., Sask. ; Ala., Alaska, Ariz., Ark., Calif., Colo., Conn., Del., D.C., Fla., Ga., Idaho, Ill., Ind., Iowa, Kans., Ky., La., Maine, Md., Mass., Mich., Minn., Miss., Mo., Mont., Nebr., Nev., N.H., N.J., N.Mex., N.Y., N.C., N.Dak., Ohio, Okla., Oreg., Pa., R.I., S.C., S.Dak., Tenn., Tex., Utah, Vt., Va., Wash., W.Va., Wis., Wyo. ; Mexico; Central America; South America; widely introduced in Old World. 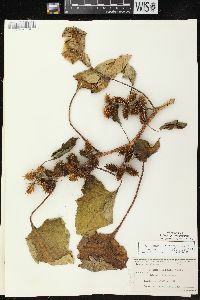 Recognition of a dozen or more taxa (treated as species, subspecies, varieties, and/or forms) has been proposed for plants treated together here as Xanthium strumarium. Bases for the various taxa mostly involved subtle differences in the burs. Frequent to common throughout the state in moist places along streams, about lakes, in dried-up ponds, cornfields, and cultivated grounds in general. This species is a very annoying weeds in the cornfields of the Lower Wabash Bottoms. Plants 2-20 dm, appressed-hairy or subglabrous; lvs long-petiolate, broadly ovate to suborbicular or reniform, generally cordate or subcordate at base, sometimes shallowly 3-5-lobed, often 15 cm; staminate heads in a terminal cluster, the pistillate ones in several or many short axillary infls; bur broadly cylindric to ovoid or subglobose, 1-3.5 cm, covered with stout hooked prickles, terminated by 2 straight or in ours ±incurved beaks; 2n=36. Fields, waste places, flood-plains, and lake- and sea-beaches; now a cosmopolitan weed, probably originally native only to the New World. July-Sept. Our most common phase is var. canadense (Mill.) Torr. & A. Gray, with the burs brownish or yellowish-brownish, 2-3.5 cm, the lower part of the prickles conspicuously spreading-hairy as well as ±stipitate-glandular. (X. echinatum; X. italicum; X. pensylvanicum; X. speciosum) Also found throughout our range is var. glabratum (DC.) Cronquist, with merely atomiferous- glandular or glandular-puberulent to subglabrous, commonly paler burs seldom over ca 2 cm. (X. americanum; X. chinense; X. cylindraceum; X. echinellum; X. globosum; X. inflexum) Var. strumarium, with straight-beaked, yellow-green, merely puberulent burs to 2 cm, occurs in tropical Amer. and in s. Europe, and rarely in our range as a waif.